It is time to bid goodbye to endless hours of laborious scrubbing that could take you all day to clean a small soiled patch. The magical solution presented by Sun Joe SPX3000 is the answer to all your cleaning woes. Portable and lightweight, this sleek machine is a beauty that can be lugged anywhere around the house with ease. The extremely powerful motor builds up enough pressure to kick out the stubborn stains left on your driveway or porch. You no longer have to fret too much about oil stains left by oil leaking from your car, or the tell-tale, dirty footprints you inadvertently leave on the driveway and porch when you come back after pottering in your garden for a couple of hours. Leave it to Sun Joe SPX3000 efficiently clean up any sort of stain that stubbornly remains on the floor even after a brisk round of cleaning. Certain kinds of persistent stains and dirt need to be cleaned under high pressure, and this pressure washer is the best answer to all such cleaning tasks that can otherwise turn into nightmares. You can get your Sun Joe SPX3000 pressure washer started almost instantly with the push of a button, unlike gas washers that have starters that could give trouble while starting. The operations are so simple that even a kid can operate this machine without any difficulty. The extra long power cord, and the long pressure hose make any cleaning task in the backyard or the driveway simple and easy. The unit runs smoothly and is almost noiseless, except for the noise from the water jets hitting the surface at high pressure. The nozzles do a great job, and can be changed without any difficulty. 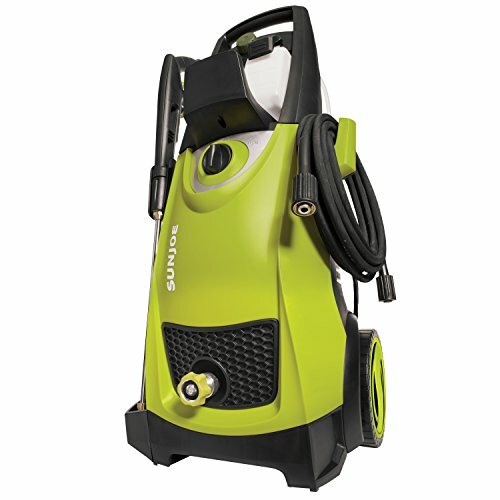 Being an electrically operated pressure washer, Sun Joe SPX3000 is almost noiseless, especially when compared to the gas operated pressure washers. Moreover, as there is no exhaust smoke, you are saved from the trouble of inhaling poisonous carbon-monoxide that is associated with the exhaust from gas based equipment. In spite of producing an impressive 2030 PSI of water pressure, the associated noise produced is quite negligible. When compared to a gas operated pressure washer Sun Joe SPX3000 is slightly less powerful, as it is electrically operated. With 2030 pounds per square inch of water pressure, and 1.76 GPM this pressure washer produces just about enough power to handle regular cleaning tasks. However, if you wish to tackle stubborn stains, you probably need a gas operated pressure washer that packs more power. This pressure washer comes with several features that make it suitable to clean plain surfaces like driveways and backyards, and difficult areas like rooftops, gutters, and insides of drainage pipes. Equipped with a trigger gun and spray wand holder, Sun Joe SPX3000 makes all your cleaning tasks a pleasure. The unique detergent tanks with the detergent selection dial let you choose the detergent according to the concentration of the stains you propose to clean. This sturdy pressure washer is built using tough plastic components, making it quite durable and long lasting. It is perfect for household cleaning tasks. Care needs to be taken while attaching the metal pipe to the plastic fitting, as cross-threading can result in the plastic portion getting damaged easily. However, the other parts like the hoses and fittings are made of tough plastic and appear to be durable. The nozzles work perfectly, and are easy to change, whenever required. Any product needs to have efficient back up support that needs to be available around the clock. This company’s customer support team responds rather quickly, and any requests for parts or trouble-shooting are fulfilled satisfactorily. The company’s website too provides precise assembly instructions in PDF format that can be downloaded. This incredibly lightweight pressure washer is handy and comes with extra large wheels that can be maneuvered over any rough terrain without any difficulty. The unique detergent selector helps take care of touch dirt effortlessly. The nozzle cleans a strip of area that is pretty narrow at around 4 to 5 inches width. This results in a lot of time being spent to cover large areas and can prove to be a bit tedious when cleaning large backyards and driveways. Priced at around $190, Sun Joe SPX3000 is perfect for most households. A versatile machine packed with power, it is great when it comes to performance. It is capable of handling a variety of cleaning tasks around the home like cleaning the backyard, driveway, portico, cars, boats, trucks, lawn equipment and a host of others. The highlight is the 1,800 watt motor (14.5 amps) capable of an impressive 2030 PSI (pounds per square inch) pressure and 1.76 GPM of water flow that ensures maximum cleaning power. The machine is perfect for removing stubborn tar and grease stains, oil and mildew stains, caked mud and rust deposited on steel surfaces. The dual detergent tank system lets you use mild and strong detergents, according to the surface you intend to clean. The 9L on board detergent tanks are removable and can be easily refilled. The array of 5 quick-spray nozzles let you select the pressure according to the requirement.